Approximately 43-1/4 inches / 110 cm tall. 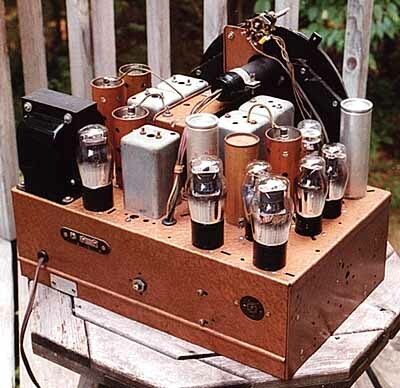 Tube complement: 6K7G RF, 6L7G mixer, 6J5G oscillator, 6K7G IF, 6H6G detector, 6J5G 1st audio, 6J5G 2nd audio, 6J5G phase inverter, (2) 6V6G push-pull audio output, 6T5 tuning eye, 5Y4G rectifier. This is the high-performance 12-tube chassis. It has "Electric Automatic Tuning . . . Zenith's newest, most exciting feature. Press the Robot Self-Starter—an electric motor spins the needle to your station! Truly automatic station-changing without a sound between stations, yet instant music when you stop at the station selected." 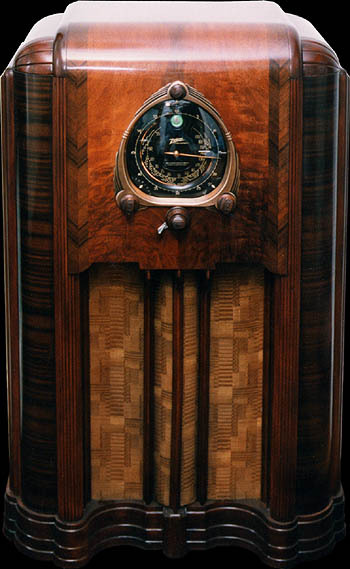 Had I been alive and of a radio-buying disposition in 1938, I would have looked at this fantastic dial and squandered all my money on this model. 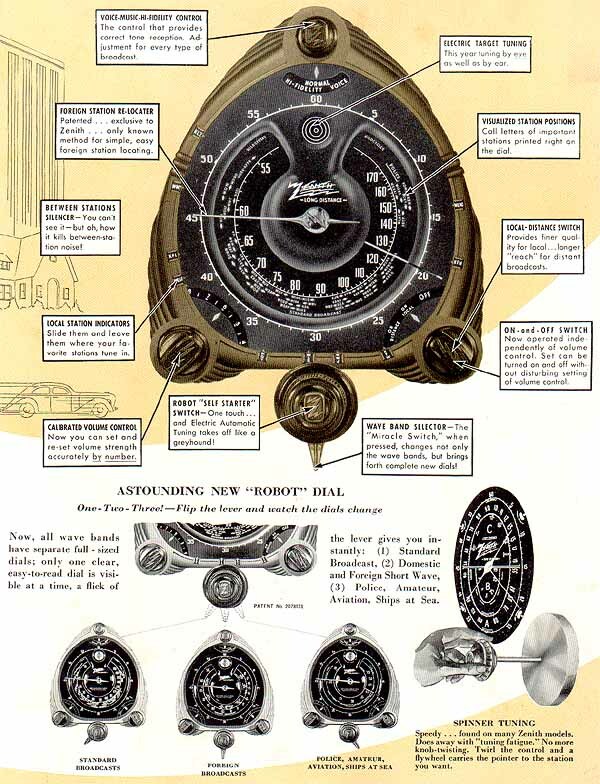 1938 was the year Zenith introduced its "robot dial" feature. "The Robot Dial is almost human . 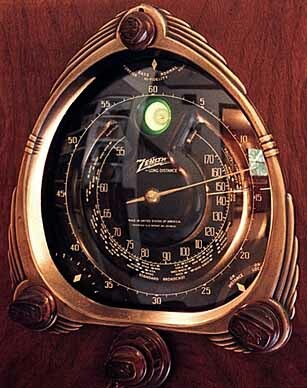 . . Now, all wave bands have separate full-sized dials—but there is only one clear, easy-to-read dial showing at one time, giving you (1) Standard Broadcast, (2) Domestic and Foreign Short Wave, (3) Police and Amateur." Above, a close-up shot of the type 6T5 tuning eye. 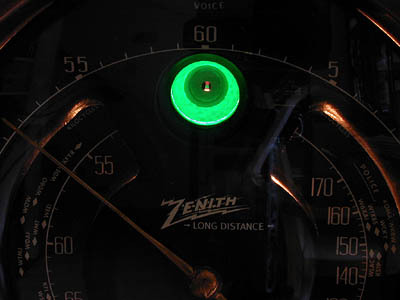 Note the unusual ring shape of the illuminated green section—it's not the typical pie wedge of the type 6G5/6U5 eye tube. At left, a scan from 1938 Zenith dealer literature. This artist's conception doesn't do the radio justice, does it? I bet not many were ordered based on this drawing alone. Perhaps that's part of the reason 12S267s are rare. 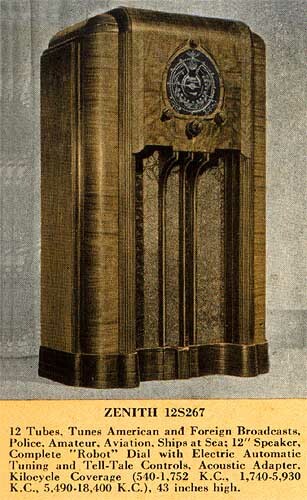 Below, a scan from a 1938 Zenith sales brochure. Copyright © 1996-2007 John C. Pelham. All rights reserved.